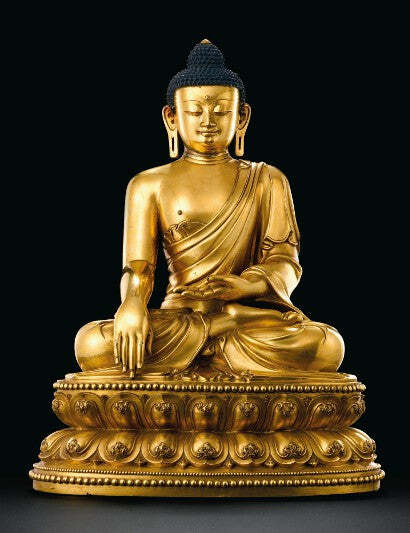 A gilt bronze casting of a seated Shakyamuni Buddha circa 1360-1424 achieved $30.5m at Sotheby's sale of Fine Chinese Ceramics and Works of Art in Hong Kong on October 8. The figure dates to the Yongle period, the high watermark of bronze Buddhist sculptures in China. Fifty four examples are documented in the collections of Tibetan monasteries. With the exception of the giant Padmapani bronze housed in the Qinghai museum, this is the largest specimen known to exist. A cast of another deity, Amitayus Xiuande - from the same era and comparable in size to the Shakyamuni Buddha - sold for $9m at Christie's in 2010. An exceedingly rare and fine cobalt blue and iron red stemcup, featuring depictions of mythical beasts achieved $10.3m against an estimate of $3.2m-4.5m - an increase of 127%. 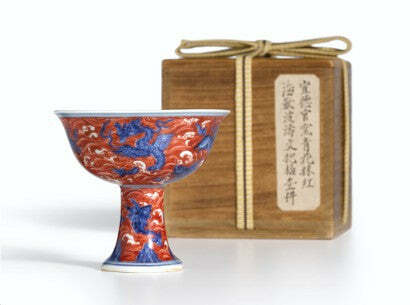 The cup dates to the Xuande period (1426-1435), and was produced at the imperial pottery at Jingdezhen. It features a number of innovations, including painting in underglaze blue and overglaze enamel, that became standard practice in subsequent eras. A Qing period blue and white vase dating to the reign of the Yongzheng emperor (1722-1735) was another notable lot, making $46m against a $15m-20m valuation - up 130%. The vase was created in Jingdezhen under the supervision of Tang Ying, regarded as the most distinguished superintendant of the time. Over the two decades he was in command, porcelain production rose to unprecedented levels, facilitating China's status as a world centre for design and innovation in this field. The sale was held as part of Sotheby's Hong Kong autumn sales, which mark 40 years since the auction house was established in Asia. Notable results include Zeng Fhanzi's Last Supper, which sold for $23.3m - a record price for a work of contemporary Asian art, and $30m for a 118 carat white diamond. The exquisite Cunliffe Musk-Mallow bowl was another highlight, selling for $18.2m in a single lot auction. Sign up to our free weekly newsletter for more of the latest from the world of collecting.